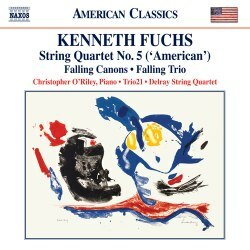 If you have been collecting the burgeoning ‘American Classics’ series on Naxos then the name of Kenneth Fuchs will not be new to you. He is one of America’s leading middle generation of composers. For example you may have come across his beautiful ‘Canticle to the Sun’ (Naxos 8.559335). There are other orchestral and choral works dotted about the catalogue (Naxos 8.559224) and Albany has also recorded him: a disc of String Quartets 2, 3 and 4 (TROY480). The present disc begins with Falling Canonsfor solo piano. It is magically played by the amazingly versatile Christopher O’Riley also known as a jazz pianist and radio and TV presenter in America. It was after reading the novel by Don DeLeilo ‘Falling Man’ which took as its starting point a figure walking out of the rubble of 9/11 that Fuchs was moved to write a major work. This book stood as a starting point for a song-cycle for baritone and orchestra, ‘Falling Man’. Once finished Fuchs, like other composers before him, discovered that some of the musical material and some of the philosophical ideas behind the piece needed to be further developed, hence this work, especially written for O’Riley. Put simply, there are seven canons beginning on a B. The first is at the octave, the second pitched on A is at the second, the third pitched on G is at the third and so on. In addition, for example, canon 4 is in 4/2 canon, 5 in 5/8 canon, 6 in 6/8 and so forth. The Falling Man theme used from the song-cycle is the one deployed in this piano work. Although it seems to start in a somewhat cerebral manner it develops movingly and mysteriously to make a satisfying and thoughtful overall composition. This disc also includes a Piano Trio entitled Falling Trio, which is also a set of seven variations and is from the same stable as ‘Falling Canons’. The clear and interesting booklet notes by the composer tell us that the introductory Falling Man theme is based again on B then “the subsequent variations are based on a successive ascending scalar passages” the opposite to the piano piece. This time these play without a break and so are not separately tracked. The language is often atonal and contrasted with the more aggressive and brittle moments there are two beautiful “reconciliatory” passages in a more romantic and diatonic vein in an attempt to “to reconcile the work’s tonal and non-tonal language”. I found the trio very moving right from the start and its length is just ideal for its material. The performance is given by the group, Trio21, which commissioned and first played it. What we hear has the complete feeling of total authority, both technically and musically. In between these two items comes the much longer String Quartet No. 5 subtitled rather bravely, bearing in the mind the famous Dvořák quartet, ‘American’. Like the Dvořák it is in four movements but there the similarities end as these have a variety of tempo alterations within them. How does a composer have something different to say in this form, which is already clogged up with too much great music? In his first movement Fuchs adopts a concise sonata-form, the second subject of which is to be developed, alongside his Falling Man theme in the lyrically desolate and slow third movement. In between comes a skittish Scherzo. The exciting finale is a clever double fugue. The opening theme of the quartet is deliberately spacious and open and, as the composer readily admits, typically American in a Coplandish way. It possesses a beautiful lyrical line as a secondary idea after about 70 seconds. The writing is always attractive and idiomatic. As a whole there is an individuality about this music which makes one want to return to the work … and to hear the other four quartets. This is the highlight of the CD. The Delray Quartet were the commissioners and first performers. They clearly understand exactly what Fuchs’ intentions are. No composer could want more. Apparently another disc of Kenneth Fuchs’s music is to appear next year on Naxos and will have the orchestral Falling Man work as its highlight.